The Rusty Knot is neither a proper dive nor on the sea. It is, however, on the banks of the Hudson -- a circumstance that Taavo Somer (of Freeman's Sporting Club) mines to full fisherman's break room-through-a-funhouse mirror effect. 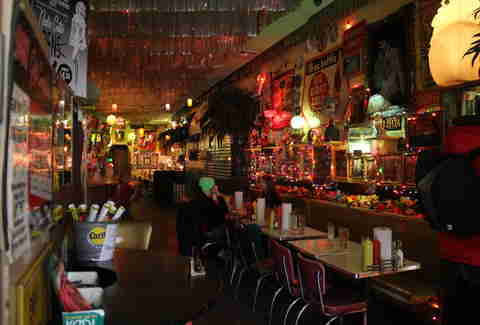 Also deployed to this end: boat wheels, electric lanterns, Antonio Varga sailor pin-ups, and lots of Sloppy Joes. And if there's no Fisherman's Friend, it's because you can revive your worn-out spirits just as effectively -- and way more cheaply -- with $.99 beer. The East Village's New Orleanian saloon ensures you don't have to hop on a plane for a taste of Southern comfort or, uh, Southern Comfort. Shrimp & grits and biscuits & gravy are always on the menu here, alongside dressed-up Arnold Palmers and bottled beers from the bayou. 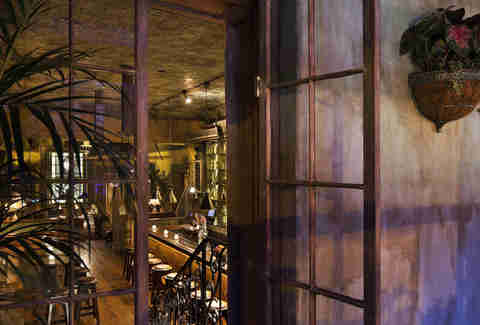 And between the richly paneled interior and the backyard garden, there's just about everything here that you'd find down there: from velvet curtains, to slatted shutters, to stained glass (salvaged from the eponymous Ninth Ward). Hell, it's even got hitching posts, 'cause hey -- you can't forget the horse. 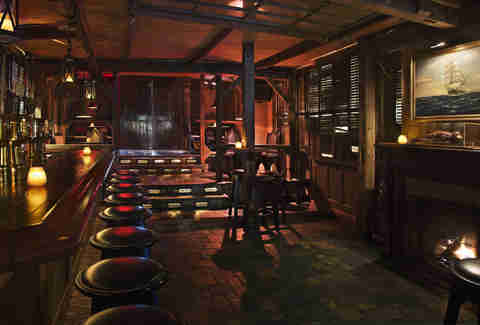 A celebratory ambience is intrinsic to pretty much any bar, but Kingston Hall also recreates a uniquely celebratory period in history: the early days of Jamaican independence. Between these mahogany walls (lined with Bond posters, natch), it sounds like the golden age of reggae and smells like the kitchen's greatest hits: jerk chicken and coconut shrimp. 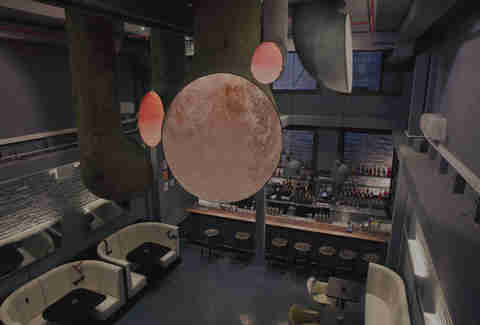 Lest it be mistaken for one of its lower-end Caribbean bar counterparts, the space features a leather-pocketed pool table, a glass solarium (wut), and two fireplaces. 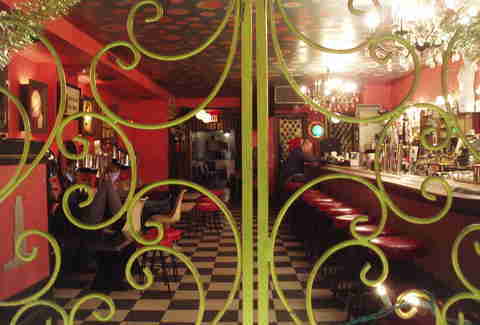 Oh, and don't mistake the suave vibes for offhandedness -- getting in on the revelry is as easy as ordering an Appleton cocktail in a coconut shell. If the phrase "the Doctor" makes you ask "doctor who?" then stay away: you're not the Whovian this fan ultra-destination deserves, nay, demands. 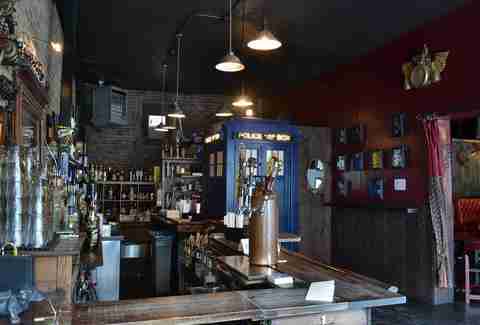 The East Coast's answer to The TARDIS Room, the deceptively unremarkable Brooklyn hole-in-the-wall houses a screening room (to show old episodes) as well as the blue police box the show's eponymous Mr. Capaldi uses to traverse space and time. And yes, he (in incarnations nine through 12) makes an appearance, as do his good friends River Song, Captain Jack, and Mr. Pink -- if not in the flesh, then on the character-inspired cocktail menu. Not much changed when the former Thomas Beauty Salon became an alcohol-serving establishment. Vintage jams started playing again, chrome-domed hair dryers started re-doubling as armchairs, and manicurists kept on painting nails. Sure, the latter-day Beauty Bar is now host to the odd comedy set or back-room dance party, but otherwise the most notable change is the aforementioned booze, which has allowed for the actually really great-sounding $10 "Martinis and Manicures" deal. In an effort to channel the monastics who have so famously mastered brewing, Burp Castle goes a step beyond to channel their world itself. 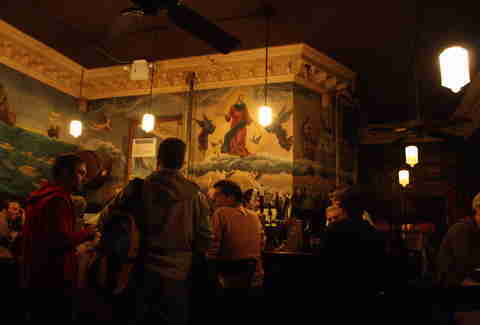 Though the bar staff no longer wears the monks robes of its '90s years and Gregorian chants no longer drift from the speakers, the walls still bear Renaissance-inspired murals and the designated shusher keeps voices down (less in the obnoxious way than in the shutting-up-other-people-who-are-obnoxious way). And yes, there's beer. The bottle list features 36 selections from Chimay Rouge to Delirium Tremens, while a rotating selection of white beer, pilsners, and the requisite lambic ale is always on tap. It's not easy to make a Soho bar feel like it's a thousand miles from civilization, but that's the power of a well-executed nautical theme. 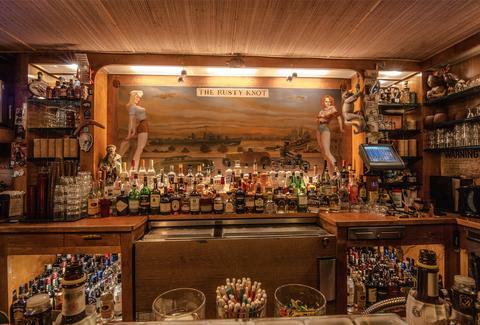 And that's what this Lafayette St bar achieves thanks to industrial-grade wall sinks, exposed ventilation shafts, and '70s boat seats arranged to transform two floors into two decks. Two Little Branch alums (Cervantes Ramirez and Joseph Schwartz) who serve as both co-founders and bartenders minister expertly to seafaring stomachs with cocktails like the New Orleans Buck, a bitter rum cocktail with notes of lemon, lime, and ginger -- a great nausea remedy should you actually forget you're on steady ground. To understand the difference between TPL and any other bar is to understand the difference between Champagne sipped from a glass and slurped through a straw from a can. Because even in the company of margarita pitchers and drinks like Paradise Hawaiian Style [sic], this is the single drink that best represents what this hyper-kitschified Chelsea dive is all about -- just like the turkey burgers, chili, and MoonPies against the rest of the self-described "cuisine." Then again, you don't need to eat or drink to get the idea -- just walk in the door. Because truest to theme of all, the neon-signposted, Christmas light-illuminated, Tonya Harding-inspired exuberance practically hits you in the face. If your idea of gathering by the fire involves Jenga and friendship bracelets, you'll be hard-pressed to find a better fit than Boerum Hill's log-cabin common room. 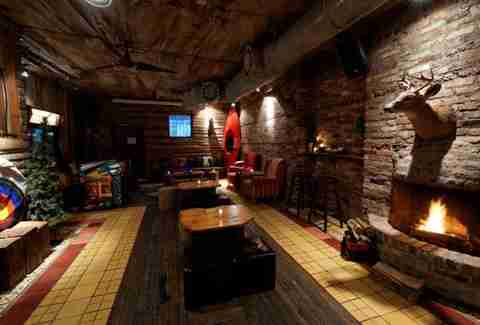 A pick for our 15 best NYC fireplace bars, Camp is styled to feel like exactly what it sounds like -- deer heads, kayaks, archery targets, and all. Campers can toast the impressive mountains-and-lakes "scenery" with drinks like the Dirty Girl Scout, a Kahlúa- and Baileys-flavored "Thin Mint in cocktail form." Oh, and large groups get free s'mores -- because if two's a company and three's a crowd, 15's a campfire. Hannah Serena Goldstein never met a theme bar she didn't like. Then again, she's never met an Outbreak the movie-themed bar. Follow her on Twitter and Instagram: @hannahserena.